John Benjamin Kendrick (September 6, 1857 –November 3, 1933) was an American politician and cattleman. He served as a United States Senator from Wyoming and as the ninth Governor of Wyoming. A cowman is a person who works specifically with cattle. 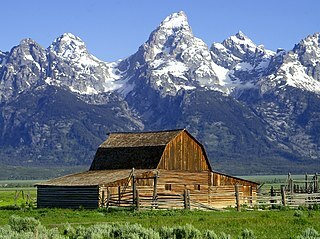 Wyoming is a state in the mountain region of the western United States. The state is the 10th largest by area, the least populous, and the second most sparsely populated state in the country. Wyoming is bordered on the north by Montana, on the east by South Dakota and Nebraska, on the south by Colorado, on the southwest by Utah, and on the west by Idaho and Montana. The state population was estimated at 577,737 in 2018, which is less than 31 of the most populous U.S. cities including Denver in neighboring Colorado. Cheyenne is the state capital and the most populous city, with an estimated population of 63,624 in 2017. The population was 5,551 at the 2010 census. It is the county seat of Cherokee County. Sheridan is a city in Sheridan County, Wyoming, United States. The 2010 census put the population at 17,444 and a Micropolitan Statistical Area of 29,116. It is the county seat of Sheridan County. Cattle—colloquially cows—are the most common type of large domesticated ungulates. They are a prominent modern member of the subfamily Bovinae, are the most widespread species of the genus Bos, and are most commonly classified collectively as Bos taurus. A $10 National Bank Note, Series 1882 Brown Back, from the First National Bank of Sheridan, WY with the hand-signed signature of John B. Kendrick. The Wyoming Stock Growers Association (WSGA) is an American cattle organization started in 1872 among Wyoming cattle ranchers to standardize and organize the cattle industry but quickly grew into a political force that has been called "the de facto territorial government" of Wyoming's organization into early statehood, and wielded great influence throughout the Western United States. The Democratic National Convention (DNC) is a series of presidential nominating conventions held every four years since 1832 by the United States Democratic Party. They have been administered by the Democratic National Committee since the 1852 national convention. The primary goal of the Democratic National Convention is to nominate and confirm a candidate for president and vice president, adopt a comprehensive party platform and unify the party. Pledged delegates from all fifty U.S. states and from American dependencies and territories such as Puerto Rico and the Virgin Islands, and superdelegates which are unpledged delegates representing the Democratic establishment, attend the convention and cast their votes to choose the Party's presidential candidate. Like the Republican National Convention, the Democratic National Convention marks the formal end of the primary election period and the start of the general election season. The Democratic Party is one of the two major contemporary political parties in the United States, along with the Republican Party. Tracing its heritage back to Thomas Jefferson and James Madison's Democratic-Republican Party, the modern-day Democratic Party was founded around 1828 by supporters of Andrew Jackson, making it the world's oldest active political party. The University of Wyoming is a land-grant university located in Laramie, Wyoming, situated on Wyoming's high Laramie Plains, at an elevation of 7,220 feet (2194 m), between the Laramie and Snowy Range mountains. It is known as UW to people close to the university. The university was founded in March 1886, four years before the territory was admitted as the 44th state, and opened in September 1887. The University of Wyoming is unusual in that its location within the state is written into the state's constitution. The university also offers outreach education in communities throughout Wyoming and online. The Teapot Dome scandal was a bribery scandal involving the administration of United States President Warren G. Harding from 1921 to 1923. Secretary of the Interior Albert Bacon Fall had leased Navy petroleum reserves at Teapot Dome in Wyoming, and two locations in California, to private oil companies at low rates without competitive bidding. The leases were the subject of a seminal investigation by Senator Thomas J. Walsh. Convicted of accepting bribes from the oil companies, Fall became the first presidential cabinet member to go to prison; no one was convicted of paying the bribes. Grand Teton National Park is an American national park in northwestern Wyoming. At approximately 310,000 acres, the park includes the major peaks of the 40-mile-long (64 km) Teton Range as well as most of the northern sections of the valley known as Jackson Hole. Grand Teton National Park is only 10 miles (16 km) south of Yellowstone National Park, to which it is connected by the National Park Service-managed John D. Rockefeller, Jr. Memorial Parkway. Along with surrounding national forests, these three protected areas constitute the almost 18,000,000-acre (7,300,000 ha) Greater Yellowstone Ecosystem, one of the world's largest intact mid-latitude temperate ecosystems. While serving in the United States Senate, John Kendrick died on November 3, 1933. Kendrick is interred in Mount Hope Cemetery in Sheridan, Wyoming. Craig Lyle Thomas was an American politician who served as United States Senator from Wyoming from 1995 to 2007. He was a member of the Republican Party. In the Senate, Thomas was considered an expert on agriculture and rural development. He had served in key positions in several state agencies, including a long tenure as Vice President of the Wyoming Farm Bureau from 1965 to 1974. Thomas resided in Casper for twenty-eight years. 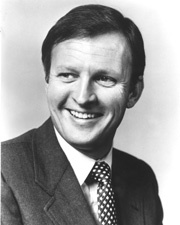 In 1984, he was elected from Casper to the Wyoming House of Representatives, in which he served until 1989. José Antonio Romualdo Pacheco, Jr. was a Californio politician and diplomat. He was elected and appointed to various California state and federal offices and posts throughout his more than thirty-year career, including serving in the California State Senate, as the 12th governor of California, and three terms in the United States House of Representatives. Pacheco remains the only Hispanic or Latino governor in the state's history as part of the U.S. He was also the state's first governor to be born in California and the only governor to be born in the state before statehood. Pacheco represented California in the United States House of Representatives as a Member of the Republican Party from March 4, 1877 to February 7, 1878, and from March 4, 1879 to March 3, 1883. He was the first Hispanic Representative from a U.S. state; several others had previously served as delegates for U.S. territories and as such did not have full voting privileges. Redfield Proctor was a U.S. politician of the Republican Party. He served as the 37th Governor of Vermont from 1878 to 1880, as Secretary of War from 1889 to 1891, and as a United States Senator for Vermont from 1891 to 1908. Isaac Toucey was an American politician who served as a U.S. senator, U.S. Secretary of the Navy, U.S. Attorney General and the 33rd Governor of Connecticut. George Smith Houston was an American Democratic politician who was the 24th Governor of Alabama from 1874 to 1878. He was also a congressman and senator for Alabama. Clifford Peter Hansen was an American politician from the state of Wyoming. 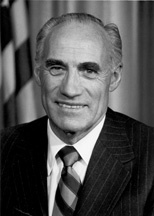 A Republican, he served as the 26th Governor of Wyoming and subsequently as a United States Senator. Earlier, he was the president of the board of trustees of his alma mater, the University of Wyoming at Laramie in Albany County, then the state's only four-year institution of higher learning. He was also a county commissioner in Jackson, the seat of Teton County in far northwestern Wyoming. Before his death on October 20, 2009, he was the oldest living former U.S. 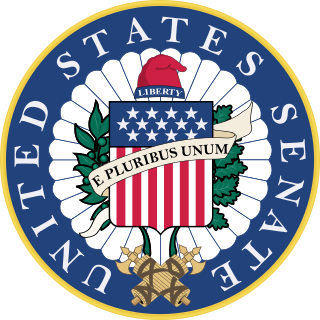 Senator as well as the third oldest living former U.S. Governor. Joseph Christopher O'Mahoney was an American journalist, lawyer, and politician. A Democrat, he served four complete terms as a U.S. Senator from Wyoming on two occasions, first from 1934-1953 and then again from 1954-1961. William Lester Armstrong was an American businessman, administrator and politician. He was a member of the Republican party and served as a United States Representative and Senator from Colorado. Milward Lee Simpson was an American politician who served as a U.S. Senator and as the 23rd Governor of Wyoming, the first born in the state. Frank Aloysius Barrett was an American soldier, lawyer and politician. He served as a Republican member of the United States House of Representatives and the United States Senate, and as the 21st Governor of Wyoming. Bryant Butler Brooks was an American businessman, rancher, politician, oilman, banker and published author. He was the seventh Governor of Wyoming from January 2, 1905 until January 2, 1911. John Eliakim Weeks was an American politician from Vermont. He served as the 61st Governor of Vermont from 1927 to 1931. Frank Ogilvie Horton was a United States Representative from Wyoming. Born in Muscatine, Iowa, he attended the public schools, graduated from Morgan Park Military Academy in 1899 and from the University of Chicago in 1903. 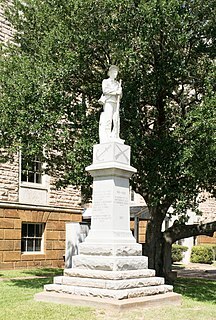 During the Spanish–American War he served as a private in Company C, Fiftieth Iowa Regiment in 1898; he moved to Saddlestring, Wyoming in 1905 and engaged in livestock raising. He was a member of the Wyoming House of Representatives from 1921 to 1923, and served in the Wyoming State Senate from 1923 to 1931, being its president in 1931. 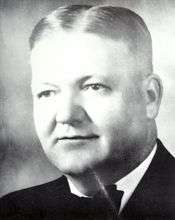 Paul Stewart was an American politician and a U.S. Representative from Oklahoma. Wally Wales was an American film actor who also appeared in many films under the name Hal Taliaferro. He appeared in more than 220 films between 1921 and 1964. William Henry Harrison was an American politician who served as a U.S. Representative from Wyoming on three occasions; from 1951 to 1955, from 1961 to 1965, and from 1967 to 1969. A member of the Republican Party, Harrison was also his party's nominee in a special election and a general election for the U.S. Senate, both held on November 2, 1954. Trail End, also known as the John B. Kendrick Mansion, is a historic home located at 400 Clarendon Avenue in Sheridan, Wyoming. The home was built and inhabited by Wyoming governor and U.S. Senator John B. Kendrick. Built from 1908 to 1913, the house was designed by William MacAlister and cost $160,000. Kendrick was a successful cattleman when he commissioned the house, and he was only beginning his political career; once he became governor in 1914 and a senator three years later, Trail End became his summer home. The house is typical of homes built by prosperous Wyoming cattlemen in the early 20th century. It was added to the National Register of Historic Places on February 26, 1970. Oliver Henry Wallop, 8th Earl of Portsmouth was a British peer and also served in the Wyoming State Legislature in the United States. 1 2 3 4 5 Bartlett, p. 255. 1 2 3 4 5 Peterson, p. 5. 1 2 "John Benjamin Kendrick (1857-1933)". The Political Graveyard. Retrieved November 18, 2012. ↑ "Sen. John Kendrick". Govtrack.us. Retrieved November 18, 2012. 1 2 "Wyoming Governor John Benjamin Kendrick". National Governors Association. Retrieved November 18, 2012. ↑ "KENDRICK, John Benjamin, (1857 - 1933)". Biographical Directory of the United States Congress. Retrieved November 18, 2012. ↑ "John Benjamin Kendrick". NNDB. Retrieved November 18, 2012. Wikimedia Commons has media related to John B. Kendrick . Bartlett, Ichabod S. (1918). History of Wyoming. Chicago, IL, The S.J. Clarke Publishing Company. Peterson, C.S. (1915). Men of Wyoming. Denver, CO, C.S. Peterson Publisher.